Senior midfielder Charlotte Martin handles the ball. Martin is one of the seniors who will be honored on Friday’s Senior Day. In what could be the most sentimental game of the year, the Wildcats will face Penn State on Friday in their regular-season finale. No. 16 Northwestern (12-6, 4-3 Big Ten) will honor its seniors for their last regular-season game at Lakeside Field, setting up an emotional match against Penn State (7-9, 3-4). Coach Tracey Fuchs said the seniors showed tremendous leadership this season. Last weekend, the Cats left Ohio with a pair of wins over Ohio State and Ohio. Now NU has a chance to go into the Big Ten tournament riding a three-game win streak. The Cats shut out the Buckeyes (9-8, 4-3) last Friday and held them to only two shots the entire game. Meanwhile, NU took 29 shots during the game and put 19 of them on goal. But Penn State put up similar numbers to the Cats when the Nittany Lions played Ohio State, attempting 25 shots. 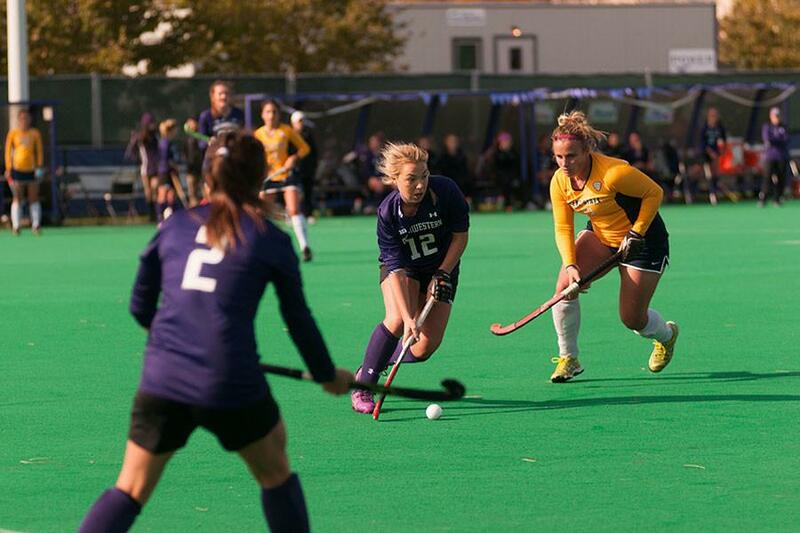 Sophomore back Sophia Miller said the team wants to limit Penn State’s offensive opportunities. NU has had an up-and-down season plagued with close losses — five of its six losses were by one goal — but the Cats remain optimistic for their game against the Nittany Lions and the Big Ten Tournament. Junior forward and leading scorer Isabel Flens said the team has come a long way since the beginning of the season and that its newly found confidence will be critical in the upcoming games. The Cats endured early losses to ranked teams — Connecticut, Duke and Maryland — but the team has shown steady progression since. Fuchs said she admires how the players did not give up on the season and how they continued to fight in every game.